Both the Broncos and the Lions were playing their second game in as many days as a part of the LMU Classic. The Broncos used a second-half push to secure their second consecutive win to open the 2014-15 season. Two wins in two days. That's not a bad way to open the season by any means. The second day of the LMU Classic saw both the Boise State Broncos and the Loyola Marymount Lions playing their second game in two days. Both teams were coming off wins in their openers, as Boise State toppled San Diego, and the Lions upended Southeast Missouri State. Boise State was coming off a tough win over the Toreros, while the Lions had a slightly easier time with the Redhawks. On Saturday, however, Boise State would use a strong second-half push to upend the Lions on their home floor, and leave the LMU Classic with a perfect 2 - 0 record to kick start their season. The Broncos would defeat the Lions 77 - 69. But, it did not always look so positive for the Broncos. Boise State would race out to an early 6-point lead over the Lions, headlined by some solid three-point shooting and a balanced scoring attack that saw 5 different players get on the board early. Both teams would trade baskets as the half went along, before the Lions would finally take the lead on a three-point play from Evan Payne. The Lions would hold a slim 1-point lead in the dying seconds, before Payne would connect on a three ball to extend Loyola Marymount's lead to 4 entering the break. In the second half, Boise State started off like they did in the first half, with a three ball from Nick Duncan just 10 seconds into the half. The Broncos would eventually tie the game, before the Lions would stretch the lead back to 4 with just over 12 minutes to play. The Broncos kept hanging around, and the Lions could never pull away. The teams would stay within 3 points of each other until the 4:00 minute mark, and that is when Boise State would take over the game for good. The Broncos would take the lead on a Mikey Thompson layup, making the game 63 - 61 in favor of Boise State. The Broncos would never look back, as they capitalized on some costly turnovers by the Lions and failed offensive sets. In a span of two minutes, the Broncos held a 10-point lead. The Lions would not go down without a fight, as a quick four points by the Lions, capped off by a David Humphries three pointer, trimmed the lead to 6. However, that's as close as Loyola Marymount would get, as clutch costless throw shooting as the game wore down allowed Boise State to maintain their lead and pull out the 8-point victory. The Broncos were led by a balanced scoring attack that saw four different players score in double figures. Mikey Thompson and Nick Duncan both led the way for the Broncos with 15 points in the win. Anthony Drmic added 12 points for the Broncos, while Derrick Marks added 11 points to go along with a team-high 6 assists. Evan Payne led the way for the Lions, scoring a game-high 22 points and adding a team-high 5 assists. Godwin Okonji recorded a double-double, scoring 15 points and pulling down a game-high 10 rebounds, and Marin Mornar added 13 points in a losing effort. The Lions held a slim margin over the Broncos in terms of rebounding, outrebounding Boise State 32 - 29. 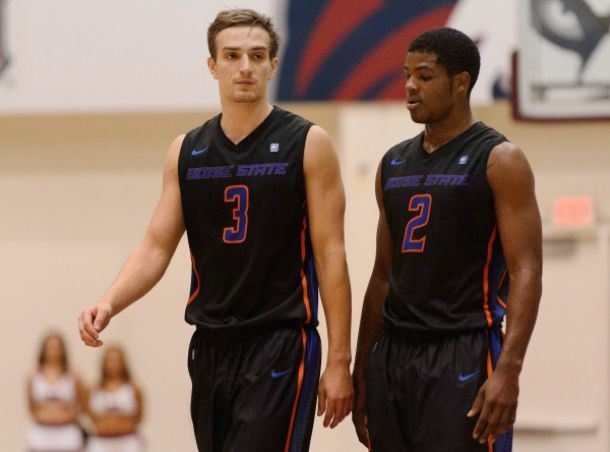 However, it was Boise State's three point shooting that ultimately made the difference. The Broncos made 8 three pointers, to the Lions 4. Boise State was also 21 - 22 from the costless throw line, while the Lions were only 17 - 22. Boise State's showing over their first two games of the season has to give fans hope going forward into the season, and it should also give the Broncos some momentum as the season gets rolling. The Broncos head home for their home opener on Tuesday as they take on the Montana Grizzlies, before heading back on the road for a date with the Wisconsin Badgers on November 22nd. Loyola Marymount goes out on the road on Thursday, November 20th, to take on the Arizona State Sun Devils in what should be a tough test for the Lions.